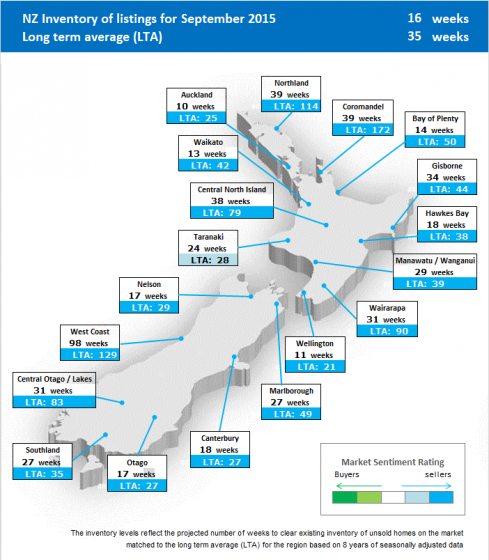 AUCKLAND, 1 October 2015 – There are now fewer residential properties listed for sale nationwide than at any time since 2006, potentially longer, according to new data released by Realestate.co.nz. The largest New Zealand website dedicated only to property represents over 97% of all agent supplied property listings in the country – more than any other single resource. 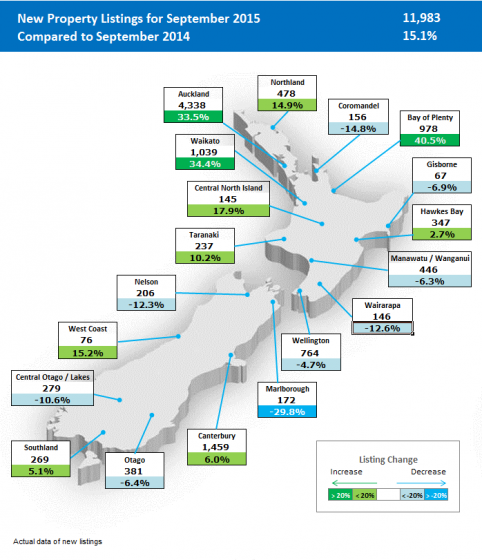 The data shows that in September there were only 30,988 properties for sale across New Zealand. Over the last eight years, the number of the homes for sale climbed steadily to a high point of 58,137 in April 2008. It remained consistently near 50,000 for another three years, before starting a slow, steady decline to the present level. “We use a metric we call inventory, a measure of supply and demand that indicates how long it would take, in theory, for all the current properties on the market to be sold at the average rate of sales. In September, inventory nationally dropped to its lowest level since we’ve started keeping records,” says Skipper. 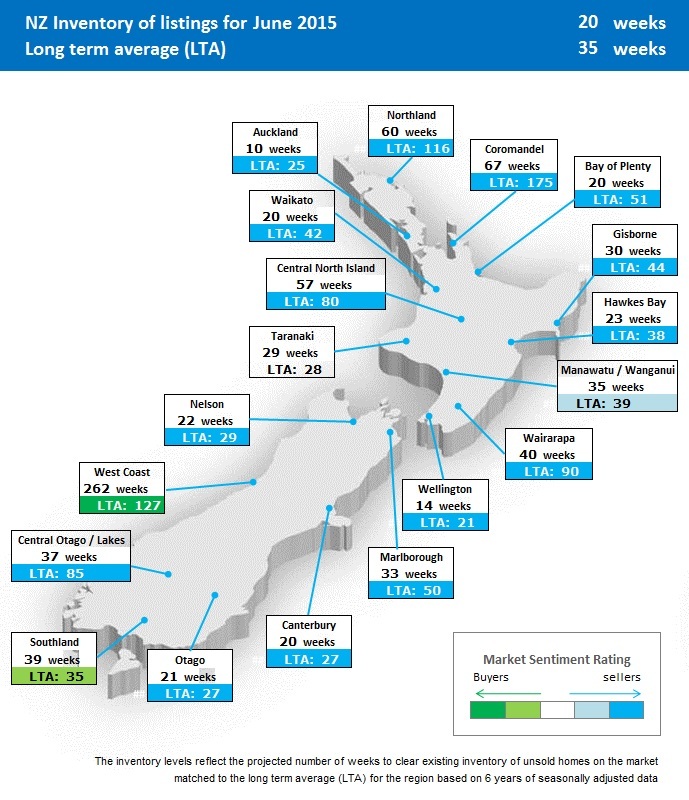 The current inventory levels across all 19 regions of New Zealand are now below their respective long-term regional averages. 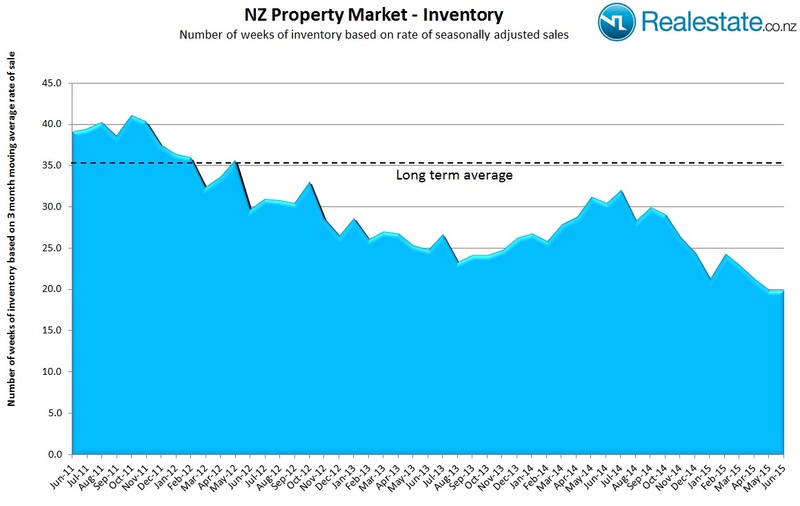 “The fact that inventory is so low may seem surprising, given that we have seen an increase in listings in most regions compared to September last year, especially in Auckland, Waikato and Bay of Plenty. Significantly, these are the three regions with the lowest level of inventory in the country, along with Wellington. The simple truth is that these properties are now spending less time in the market, suggesting that market pressures will remain high while the current rate of turnover continues,” says Skipper. 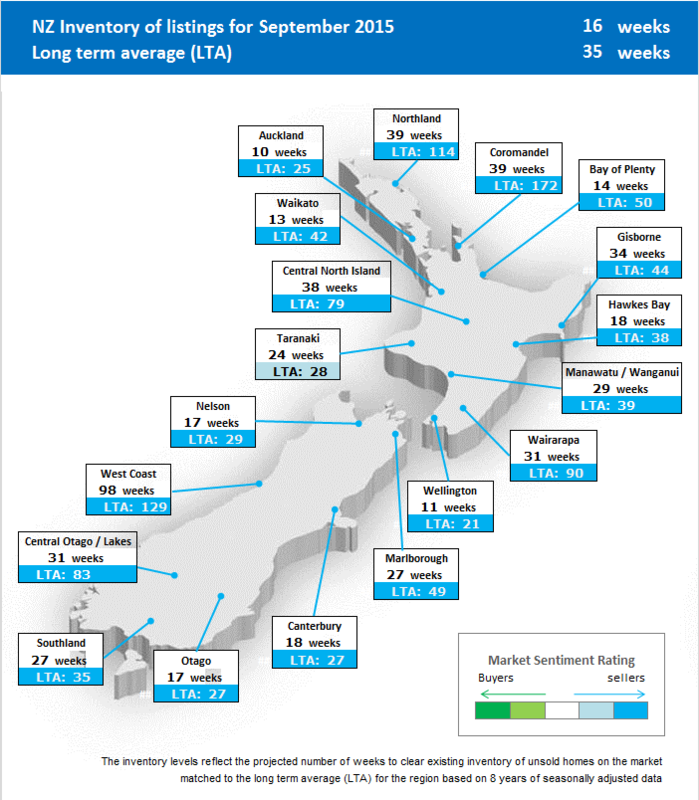 While Realestate.co.nz data for September reveals that the average asking prices in many regions have dropped since August, the longer term trend shows strong increases in asking price. Six regions in the country achieved their highest average asking price in September 2015, with a further seven reaching their record in August. The remaining six regions have all recorded their highest ever average asking price in the last six months. AUCKLAND, 1 September 2015 – The seasonally adjusted average asking price for homes for sale in New Zealand in August was $568,215. This reflects an increase of 5.5% in just one month, since the previous record high national asking price of $538,484 set in July. 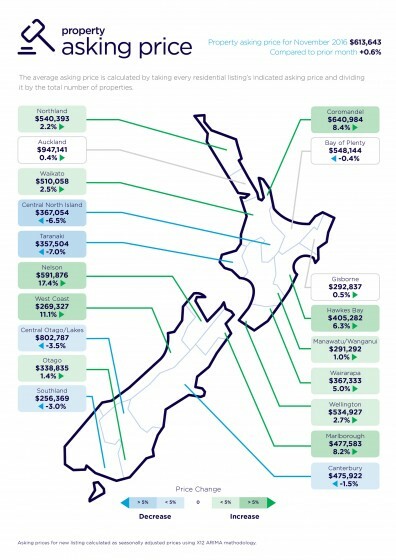 Data analysis by Realestate.co.nz, New Zealand’s largest property listing website, reveals that the surge in property prices is not limited to Auckland, where a new record asking price of $832,613 was reached (up from the previous record $820,016 in June 2015). 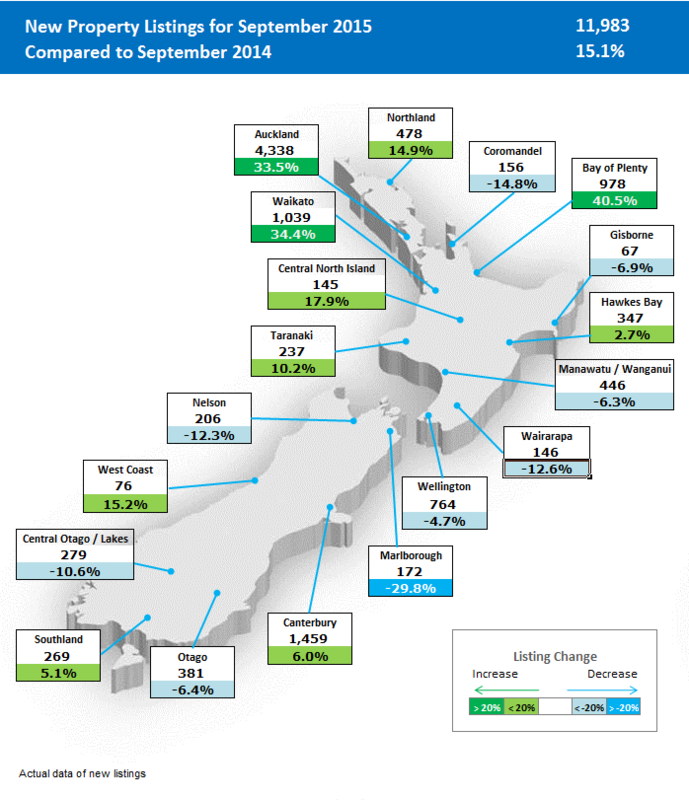 Eight of the nineteen regions across the country achieved record high average asking prices in August. 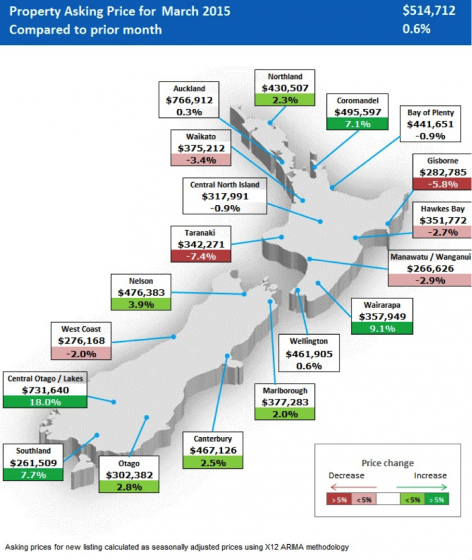 These include Wellington, where the average asking price was $479,399 (up from the previous record of $469,487 set in March 2014); Canterbury, with an average asking price of $475,066 (up from $473,011 in June 2015); and Waikato, with an average asking price of $403,640 (up from $398,251 in July 2015). Significantly higher prices were also recorded in the Bay of Plenty, the Central North Island and Hawkes Bay. “The pressure on the Auckland market is clearly being felt in neighbouring regions as well, especially Waikato and Bay of Plenty,” says Brendon Skipper, CEO of Realestate.co.nz. In conjunction with the record prices nationally, the inventory of properties for sale is at its lowest level since January 2007, when Realestate.co.nz started tracking this metric. 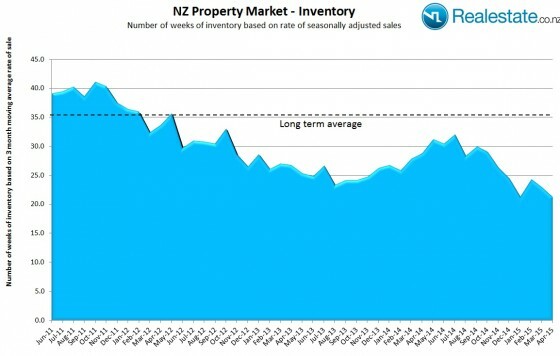 Inventory is a measure of supply and demand that indicates how long it would take, in theory, for all the current properties on the market to be sold at the current average rate of sales. The national inventory in August was a mere 17 weeks, compared to the long-term average of 35 weeks. The shortage of inventory is most acute in the major centres – 9 weeks in Auckland, 12 weeks in Wellington, 14 weeks in Waikato and 18 weeks in Canterbury. The only region where the inventory is above the long-term average is West Coast, where there is 230 weeks of inventory, compared to a long-term average of 129. 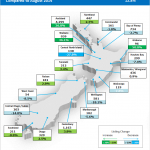 AUCKLAND, 1 August 2015 – A viewership analysis by Realestate.co.nz, New Zealand’s largest property listing website, indicates that visitors to the portal who are primary speakers of an East Asian language comprise around 5% of all online traffic viewing Auckland property, up from 4% the same time last year. Moreover, geo-location analysis shows that almost half the East Asian online traffic is likely to originate in New Zealand from immigrants already living here. Realestate.co.nz carried out the data analysis of its online traffic for the period January to April 2015. Total traffic from the ten largest East Asian countries and territories, measured as a percentage of unique sessions, accounted for 2.8% of total traffic for Auckland properties on Realestate.co.nz in January to April 2015, compared to 2.98 % for the same period last year. These nations and territories include China, Hong Kong, Taiwan, Malaysia, Singapore, South Korea, Japan, Indonesia, the Philippines and Thailand. “This data indicates that interest in New Zealand property originating from these ten countries in East Asia has remained at a consistent and relatively small proportion of total traffic to our website, comprising slightly less than 3% in both periods measured in 2014 and 2015,” says Brendon Skipper, CEO of Realestate.co.nz. The default language setting in the device of each visitor to Realestate.co.nz is automatically detected, which allows the property portal to create a linguistic map of total traffic. The company is able to quantify traffic numbers for each language setting, regardless of location, including speakers of Chinese, Korean, Japanese and other East Asian languages who are residing in New Zealand. 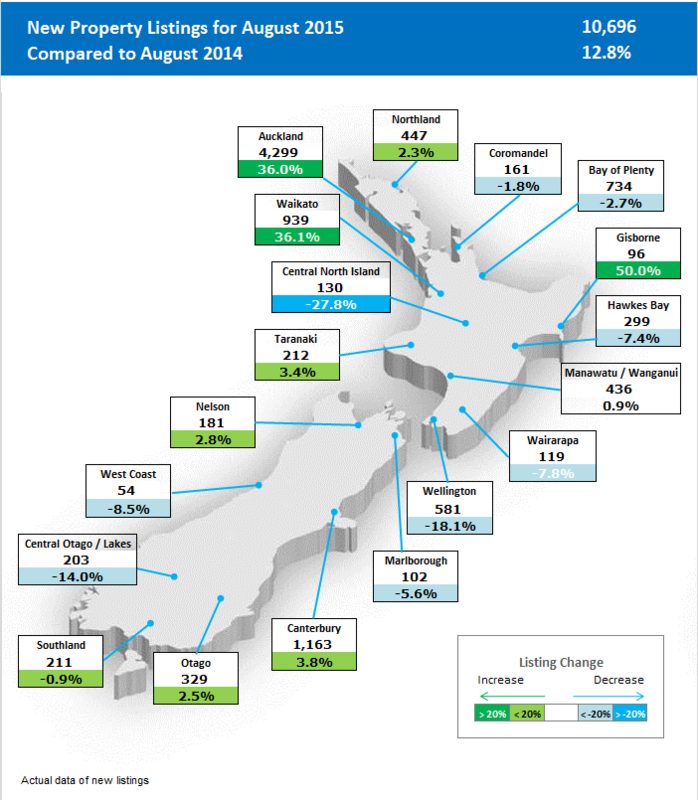 Property asking prices nationwide have stabilised in July, with an increase of only 0.1% recorded. 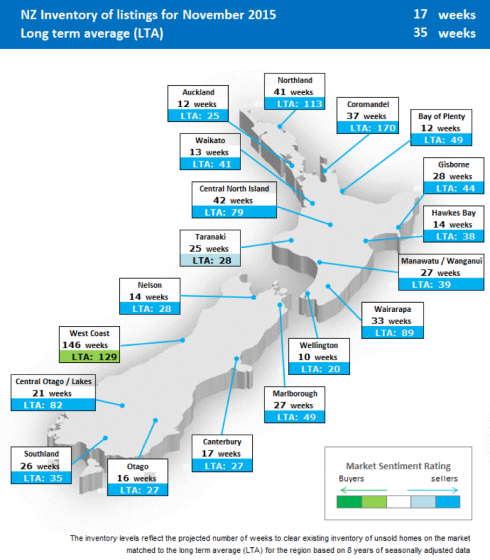 Asking prices in Auckland, Canterbury, Wellington and Hawke’s Bay have all fallen marginally, with Waikato the only major population centre to show an increase. 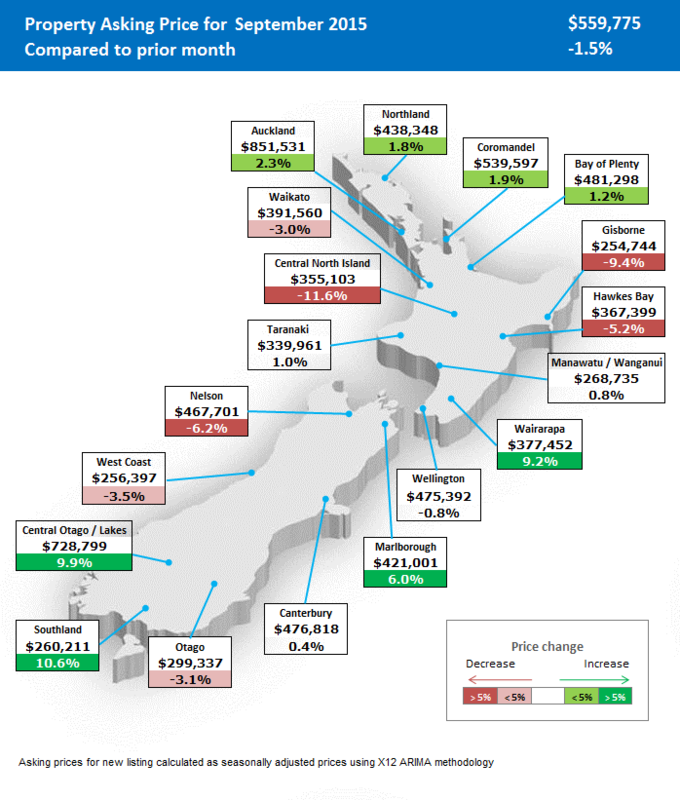 The average asking price in Auckland decreased by 1.4% – the most significant decrease since October 2014. 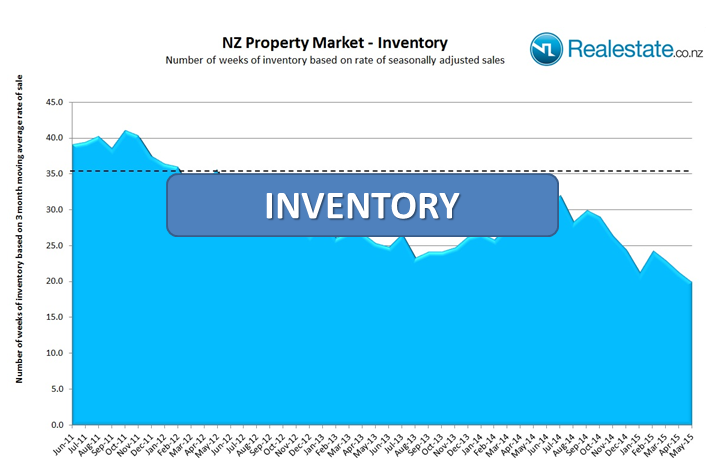 Nationally, the market is tight, with inventory at its lowest level since Realestate.co.nz started recording this metric in January 2007. Inventory is a measure of supply and demand that indicates how long it would take, in theory, for all the current properties on the market to be sold at the current average rate of sales. 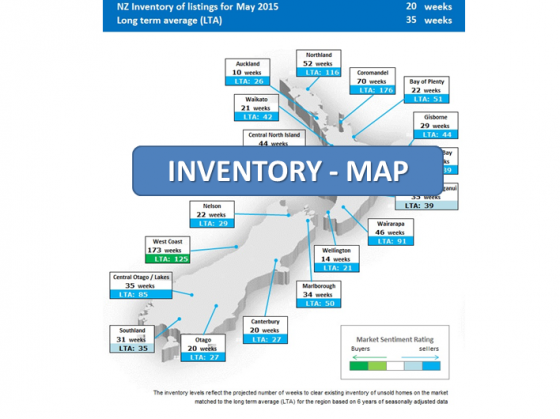 The inventory for July 2015 is 18 weeks, almost half the long-term average of 35 weeks. The West Coast and Taranaki are the only regions in the country where the current supply exceeds the local long-term average. 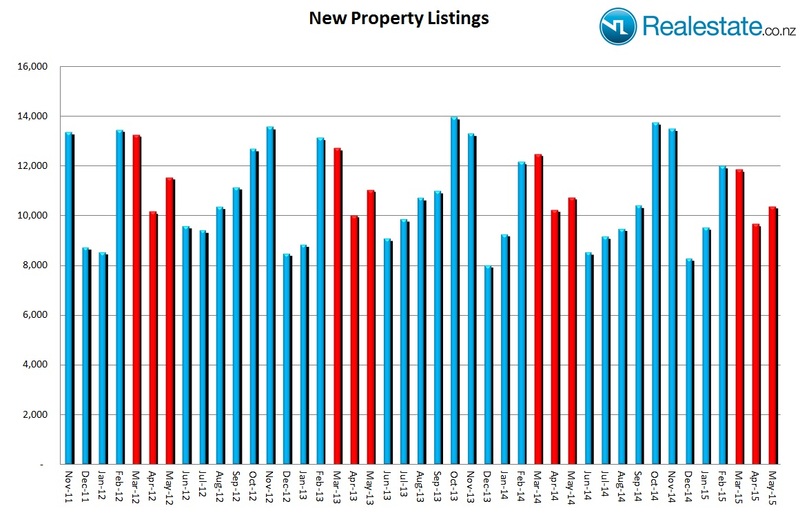 Following the usual seasonal pattern, new property listings in July 2015 increased from the previous month. Listings are also up compared to July 2014, with 5.6% more properties coming onto the market this July than in the same month last year. 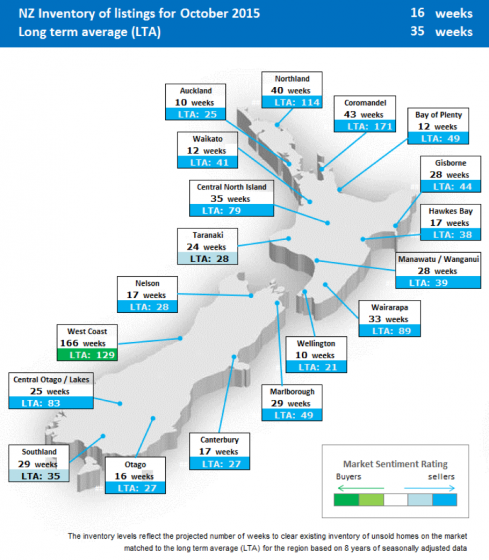 Seven of the 19 New Zealand regions had more properties coming on sale in July 2015 than in July 2014, including the Auckland market, which has a large influence on national figures. Waikato had the largest listing increase of 21.8%, followed by Auckland (+20.2%), Marlborough (+14.3%), Hawke’s Bay (+13.6%), Gisborne (+6.55), Northland (+4.9%) and Canterbury (+3.6%). Realestate.co.nz is a major sponsor of popular television show, House Hunt (8.00pm Sundays on TV One), which follows the journeys of diverse people from all walks of life across New Zealand as they look to buy their first home. The programme highlights the varied issues facing home buyers in different regions. Realestate.co.nz is the official website of the New Zealand real estate industry, and provides the most comprehensive selection of licensed real estate listings. Realestate.co.nz lists more than 250,000 properties each year, representing more than 97 per cent of all listings currently marketed by real estate professionals. 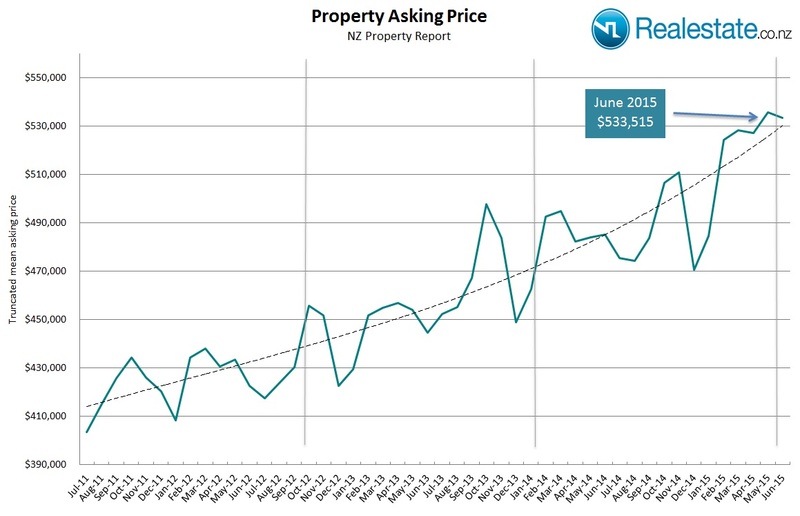 AUCKLAND, 1 July 2015 – According to Realestate.co.nz, New Zealand’s largest property listing website, the highly competitive property market has sparked a surge in mobile app usage. Not only has the total number of Realestate.co.nz mobile app users grown at a much faster rate than other platforms in the last twelve months, but the average mobile app user visits the property portal significantly more often than they did the same time last year. “While the number of buyers who use the website on any platform – desktop, mobile or tablet – has shown strong growth of 33% compared to the same time last year, mobile app users have increased by an even greater 44%,” reports Brendon Skipper, CEO of Realestate.co.nz. “But more significantly, mobile app users now use the Realestate.co.nz app even more frequently than they did before. Today, the average smartphone user visits the app 16% more often than they did a year ago in June 2014. 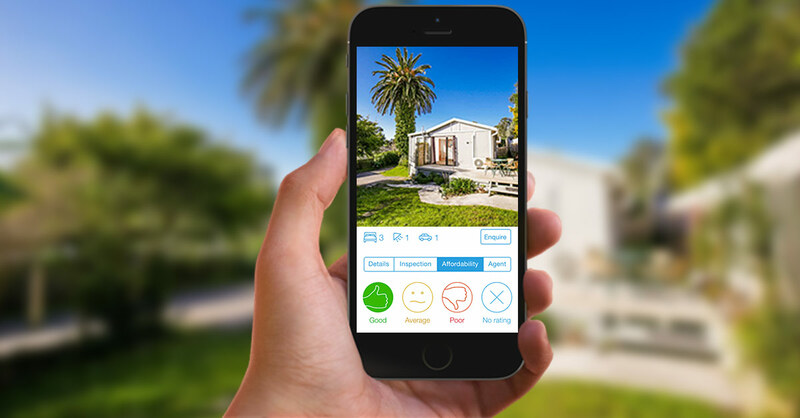 “Clearly, serious home buyers have realised that there is a competitive advantage to be gained by inspecting online listings as frequently as possible, and the Realestate.co.nz mobile app provides a powerful platform to search for properties anytime, from anywhere. “In addition, New Zealanders are clearly more comfortable and savvier in maximising the increasingly comprehensive toolset that comes with today’s smartphones and the applications that are available to them,” says Skipper. While only eight of the nineteen national regions showed an increase in average asking price in June, these increases were so significant that the national average asking price rose by 0.9% to a new record of $537,682 in June. 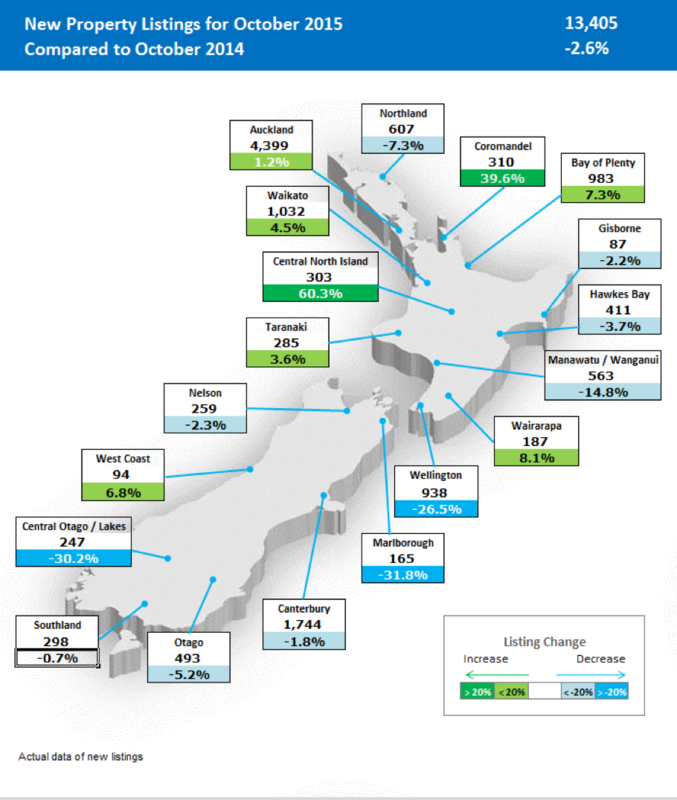 Three regions in particular saw a strong increase in the average asking price, with the Auckland market having the biggest impact nationally due to its size. 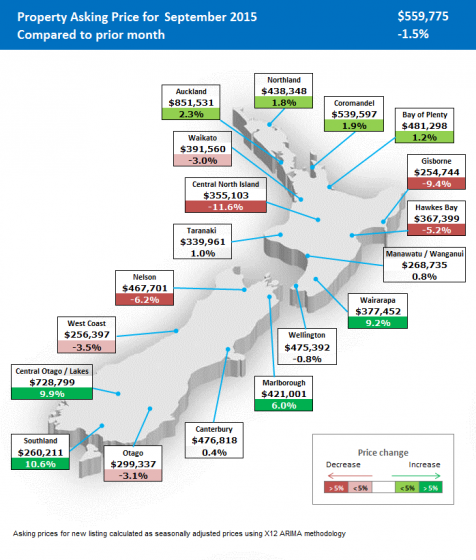 For the first time, the average asking price for Auckland homes rose above $800,000. The average asking price of $820,016 in June 2015 is 3.4% higher than the previous record of $793,260 recorded in May. 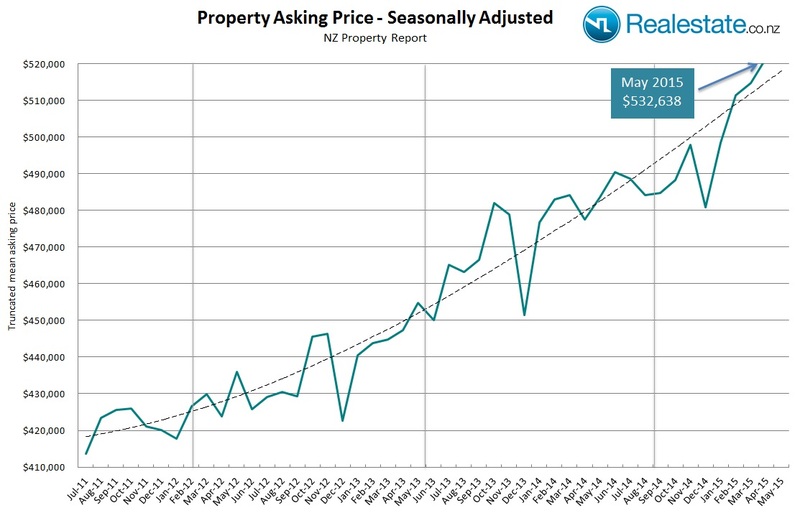 Sellers in Central Otago asked on average 9% more for their homes in June than in May, reaching an average asking price of $762,284. Gisborne asking prices experienced even higher relative growth of 10.3%, but from a lower base – the average asking price in Gisborne in June was $287,140. 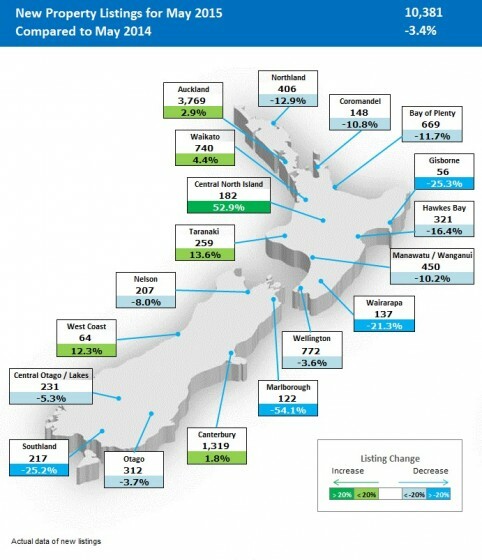 Other regions that saw monthly increases in average asking price in June include: Manawatu/Wanganui (+4.8%), Taranaki (+4.5%), Otago (+2.1%), Canterbury (+1.8%) and Central North Island (+1.7%). Major population centres such as Wellington and the Waikato saw a small decrease in the average asking price. In Wellington, it went down by 1% to $457,488, and in the Waikato by 0.5% to $385,325. A total of 8,748 new properties were listed nationwide in June this year, 2.6% more than the corresponding month in 2014. Of these, 3,138 were in Auckland. The only other region that saw more than a thousand new properties come onto the market was Canterbury, with 1,117. More than 500 new properties were listed for sale in each of Waikato, the Bay of Plenty and Wellington. Despite these new properties coming onto the market, the national average in overall inventory of available housing stock for sale remains at an all-time low of only 20 weeks. Inventory is a measure of supply and demand that indicates how long it would take, in theory, for all the current properties on the market to be sold at the current average rate of sales. 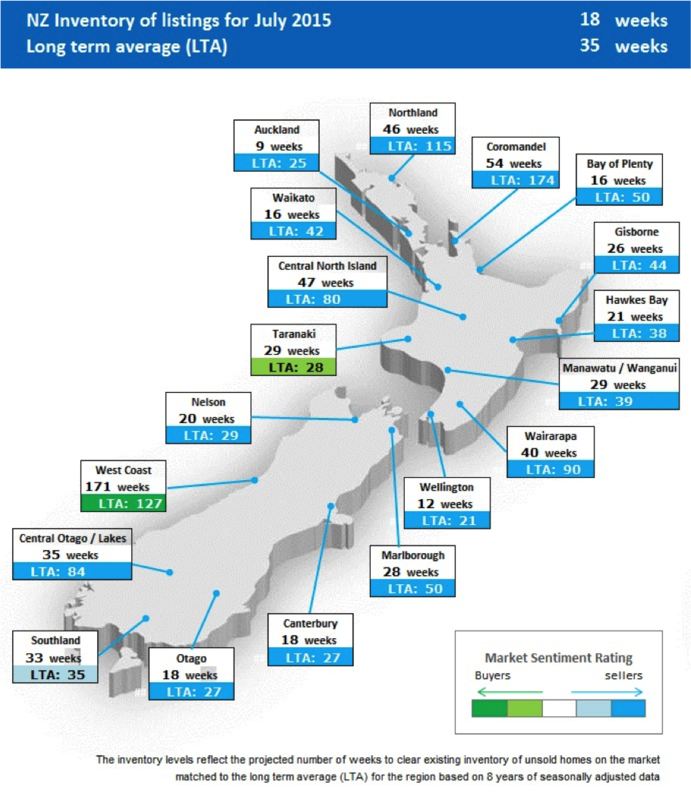 Based on these figures, only two of the 19 regions in the country are currently rated as buyers’ markets: Southland and West Coast. About Realestate.co.nz Realestate.co.nz is the official website of the New Zealand real estate industry, and provides the most c omprehensive selection of licensed real estate listings. Realestate.co.nz lists more than 120,000 properties each year, representing more than 97 per cent of all listings currently marketed by real estate professionals. AUCKLAND, 3 June 2015 – Aucklanders are significantly more interested in properties outside their region compared to the same time last year, according to the latest data from Realestate.co.n z, the website with the most property listings in New Zealand. “The number of people from Auckland looking at properties in otherparts of the country has increased significantly over the year fr om last May. This is a dramatic change in online searching behaviour, which could well be driven by record high property prices in Auckland,” says Brendon Skipper, CEO of Realestate.co.nz. Properties for sale in Hawke’s Bay have attracted the greatest increase in levels of interest, with 152.2% more Aucklanders looking at properties in that region compared to the same month last year. Other regions which have seen a jump in interest from Aucklanders include Manawatu/Wanganui (+123.4%), Waikato (+113.8%), Northland (+85.5%) and the Bay of Plenty(+83.5%). While Aucklanders are spreading the net wider when they look for property, offshore Asian investors appear to be showing less interest than before in the country’s property market, with 20% fewer viewers from Asian countries looking at New Zealand properties online this May, compared to the same month last year. However, this decrease is largely offset by a 19.9% increase in interest from investors elsewhere in the world, particularly from Australia, the USA and the UK. 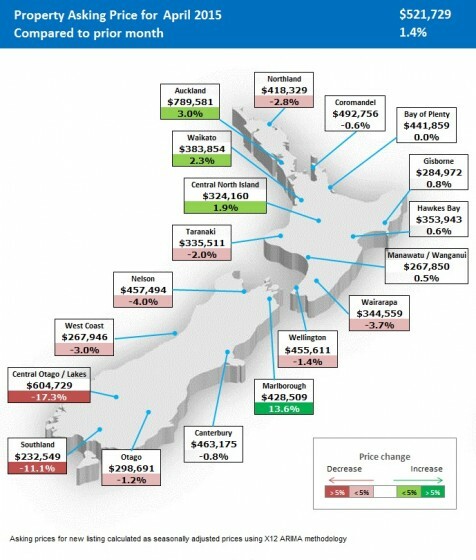 Meanwhile, asking prices for houses in Auckland stabilised in May, according to Realestate.co.nz. The average asking price in the city was $793,260, which is a marginal increase of 0.5% from the record high in April. 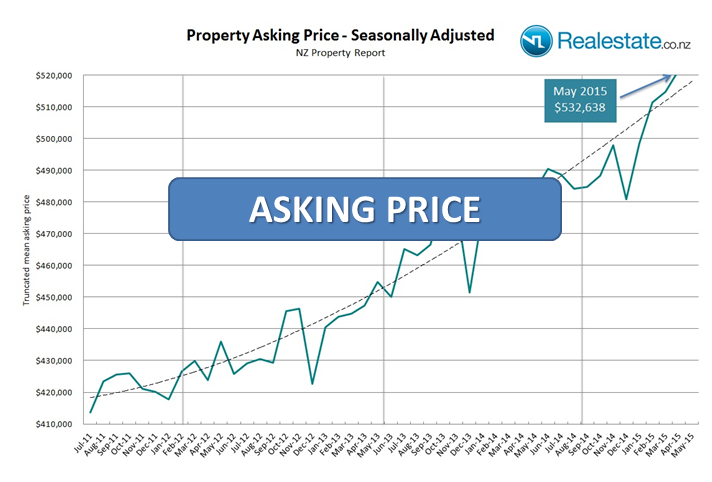 However, significant increases in asking price in a number of other regions across the country in May pushed the national average asking price to a new all-time high of $532,638, an increase of 2.1% on the previous record set in April. The biggest jump was recorded in Central Ota go, where the average asking price in May was $699,435, up 15.7% from April. 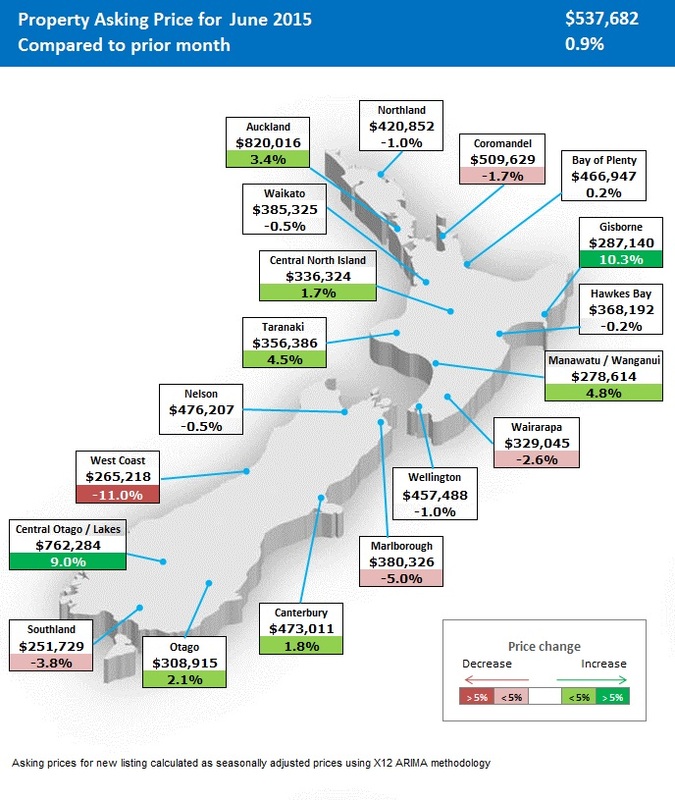 Other regions with big increases include Southland (up 12.5%, to $261,598), West Coast (up 11.3%, to $298,130), Bay of Plenty (up 5.5%, to $466,222), and the Coromandel (up 5.2%, to $518,303). Bucking this trend were Gisborne and Marlborough, where the average asking price decreased notably, by 8.7% and 6.6% respectively. There were 10,381 new listings nationwide in May, which was 3.4% less than the same time last year. 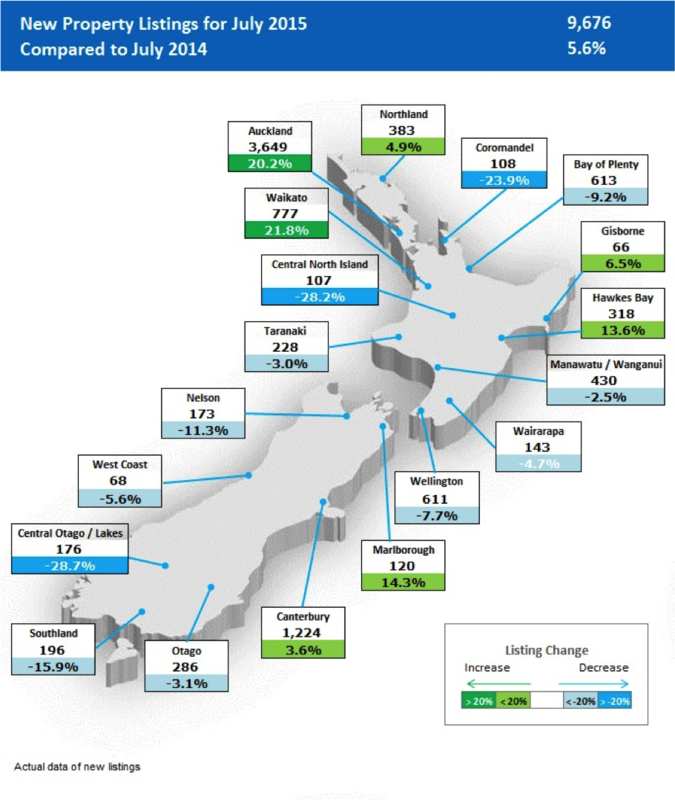 Despite the national decrease, listings in some regions did increase, such as Auckland (3,769 new listings, up 2.9% compared to May 2014), Canterbury (1,319, up 1.8%), Waikato (740, up 4.4%), Taranaki (259, up 13.6%), Central North Island (182, up 52.9%) and West Coast (64, up 12.3%). The national average in overall inventory of available housing stock for sale fell to an all-time low of only 20 weeks in May, breaking the record of 21.3 weeks set just the month before. Inventory is a measure of supply and demand that indicates how long it would take, in theory, for all the current properties on the market to be sold at the current average rate of sales. The long-term national average, since January 2007, is 35 weeks. Realestate.co.nz is the official website of the New Zealand real estate industry, and provides the most comprehensive selection of licensed real estate listings. 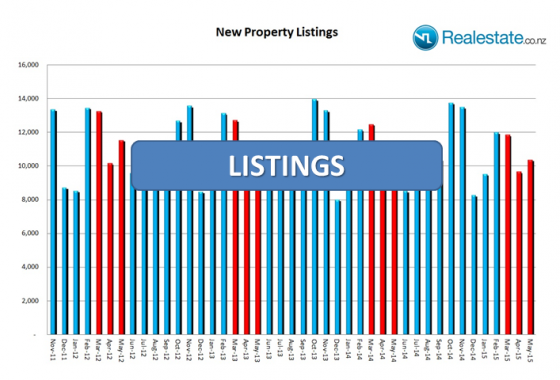 Realestate.co.nz lists more than 120,000 properties each year, representing more than 97 per cent of all listings currently marketed by real estate professionals. AUCKLAND, 1 May 2015 – The New Zealand property market in April continued the trend of the last four consecutive months with yet another increase in average asking price, creating a new record of $521,729, an increase of 1.4% on the previous month. The latest monthly property data from Realestate.co.nz showed that Auckland, where the average asking price rose by 3% to a new high of $789,581, continued to be the main driver in the overall national increase – no other region experienced a new record in average asking price in April. In fact, most parts of New Zealand experienced either little change or decreases in average asking price during the month. In Wellington the average asking price dropped slightly by 1.4% to $455,611, while Canterbury also experienced a small decrease of 0.8% to $463,175. 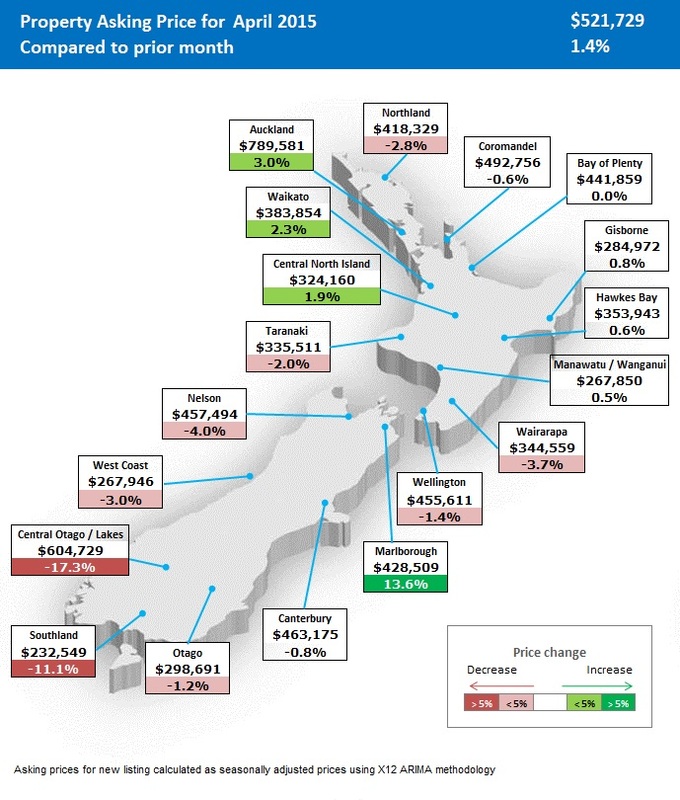 The biggest drops occurred in Central Otago where the average asking price in April fell by 17.3% to $604,729, while the average in Southland fell by 11% to $232,549. 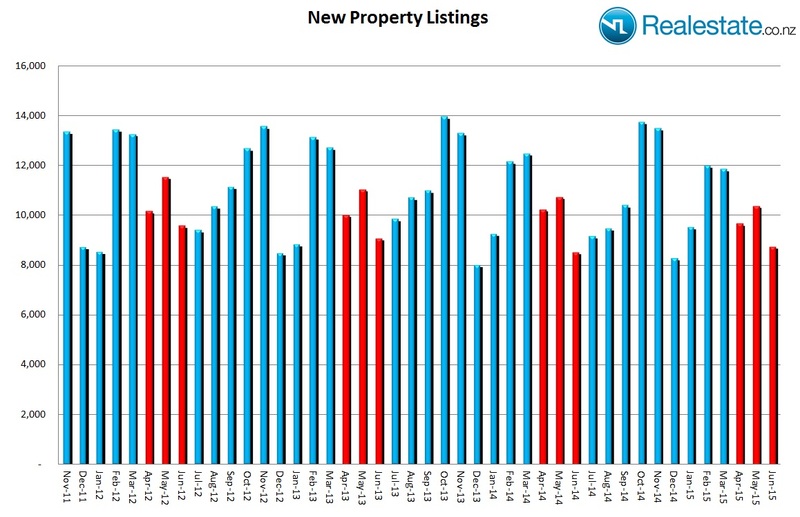 Significantly, the number of new listings was the lowest recorded for April by Realestate.co.nz, with only 9,673 coming on to the market, a fall of 5.6% on the same time last year, and a decrease of 18% from March. In addition, the national average in overall inventory* of available housing stock for sale fell to an all time low of only 21.3 weeks in April. The previous record low of 21.4 weeks was set in January, while the long-term national average is 36 weeks. A full copy of this release is available here. * Inventory is expressed as a theoretical measure of the number of weeks it would take to sell all unsold housing stock on the market at a given point in time, which includes all active listings of homes for sale no matter when they were first listed. AUCKLAND, 1 April 2015 – The average asking price of homes for sale in New Zealand in March reached a new high of $514,712, the third consecutive month of record asking prices. 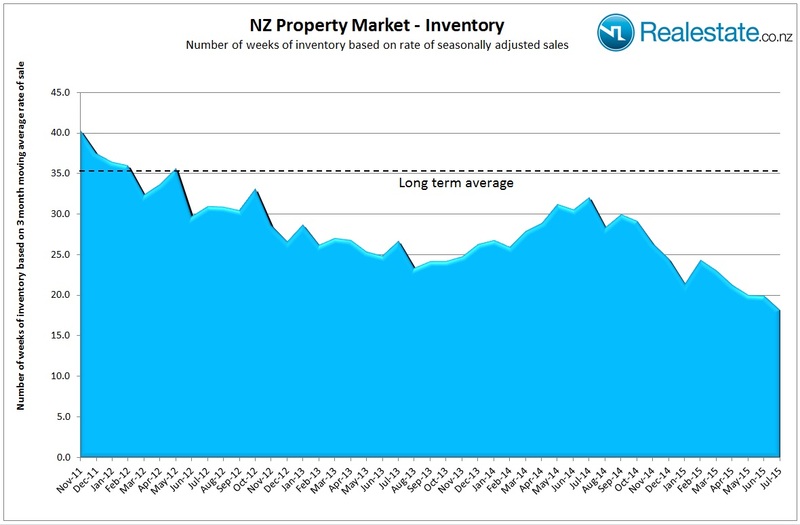 The latest monthly property data from Realestate.co.nz also showed that the number of new listings in March was 11,870, a decline of 4.9% from the same time last year, and the lowest for March since 2009. The new national high in average asking price of $514,712 was a small increase of 0.6% on the previous record of $511,412 set last month. 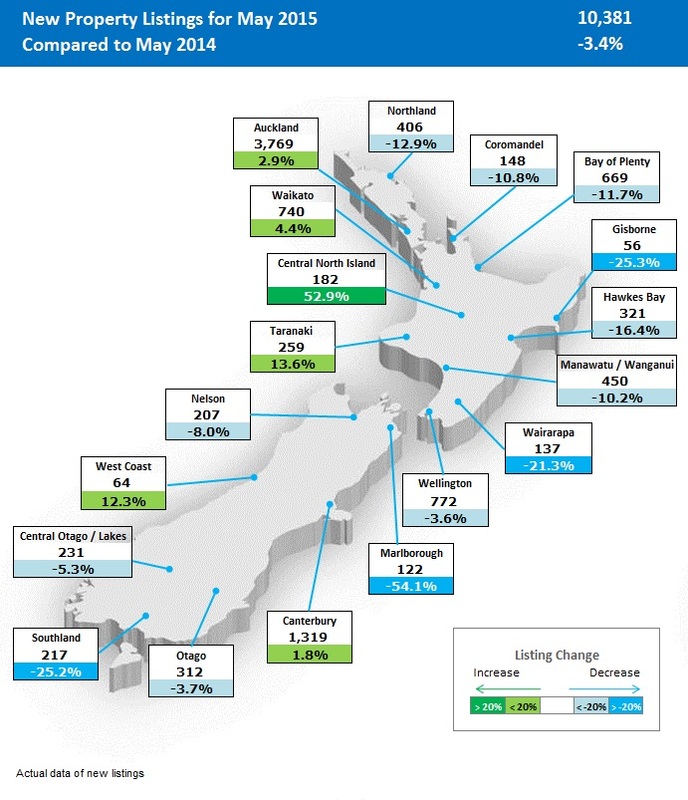 The growth in asking prices in March was also reflected in different parts of the country with three regions experiencing new records, including Canterbury and Auckland. The new high of $467,126 in Canterbury was a 1.3% increase from the previous record of $461,032 set in July last year, while Auckland’s new high of $766,912 was a 0.3% increase from the previous record of $764,424 reached last month. 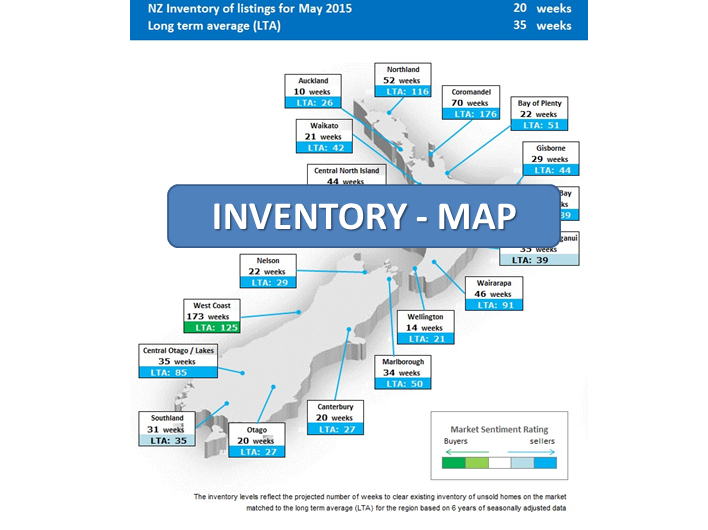 In addition, the Wairarapa also experienced a new high in average asking price of $357,949. 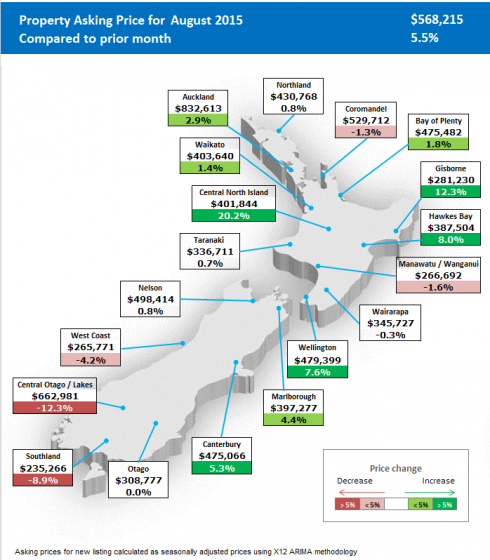 The average asking price in Wellington during March 2015 was $461,905, which is 1.6% below the all time high of $469,487 set a year ago in March 2014. 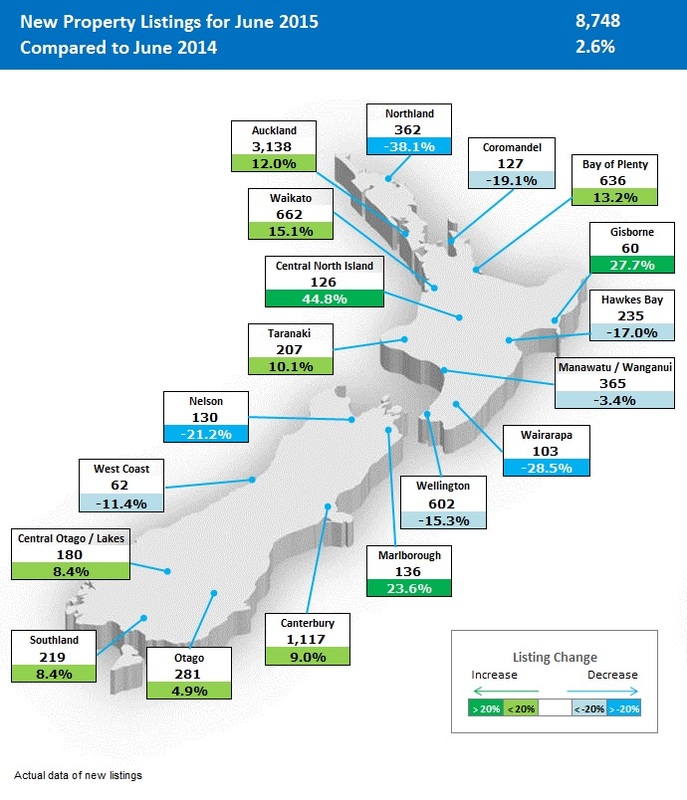 The number of new listings of homes for sale across New Zealand in March was 11,870, a decrease of 4.9% from the same month last year, and a fall of 1.1% on the 12,008 new listings in February. This is the lowest number of new listings for the month of March since the 11,456 recorded six years ago in March 2009. While Canterbury saw an increase of 3.8% on the number of new listings from March last year, both Auckland and Wellington experienced falls of 5.2% and 9.2% respectively. The national average in overall inventory* of available housing stock for sale fell slightly to 23 weeks in March, close to the record low level set in January of 21.4 weeks. “The long-term national average is 36 weeks of stock. Many regions are experiencing low inventory levels, including the three major cities,” says Brendon Skipper.